Florida cabbage palms deserve your respect for their hardiness and rugged good looks. Is there a place for them in your landscape? Well, let’s see. 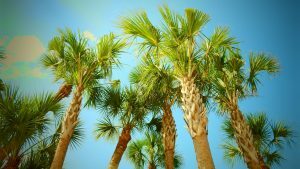 You’ll find this iconic native (and state tree) to be one of the most wind-resistant, cold-hardy palms in Florida, and it’s practically disease-free. Cabbage palms tolerate salt and drought, too. The only thing they don’t tolerate is being underestimated, which was never the case with early European settlers and Seminole Indians. Cabbages were used for thatch roofs, baskets, brooms, cabin walls and dock pilings. Even the cabbage-tasting leaf buds were cut and eaten (which kills the palm and explains why it’s primarily used for landscaping). And Florida cabbage palms aren’t scruffy-looking. They’re rugged (think Daniel Craig as James Bond). We can thank the University of Florida, who recommends cabbages be installed with booted trunks vs. pulling the boots (old fronds) off. Also, they provide a nice architectural look at night when they’re illuminated by LED lighting. So give Florida cabbage palms a chance. The designers at Venice-based ArtisTree Landscape Maintenance & Design do. They like them in rows, as a single focal point or placed in odd numbers. Cabbages can grow up to 80 feet (more often 60, though) with a dense canopy 10-16 feet in diameter. They’ll produce creamy white inflorescences that lead to small shiny fruits. 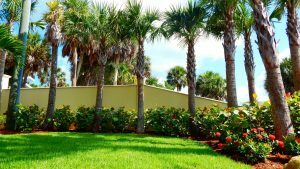 Their extreme hardiness in sun or shade makes them one of the easiest palms to grow, inland or beachside. 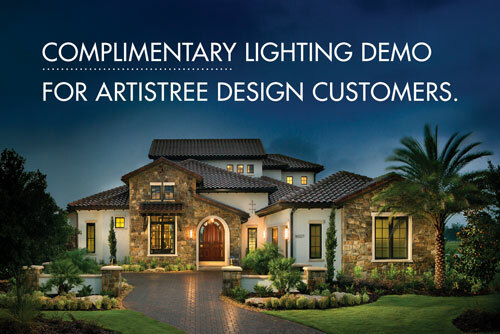 Schedule a consultation with one of ArtisTree’s award-winning designers to learn more.